For the longest time, we haven’t been allowed multiple links on Instagram. They’ve have enforced their hard and fast rule ‘There Shall Be Only One Link On Your Profile!’, but today we’re sharing a free tool that lets you add multiple links on Instagram ! huzzah! 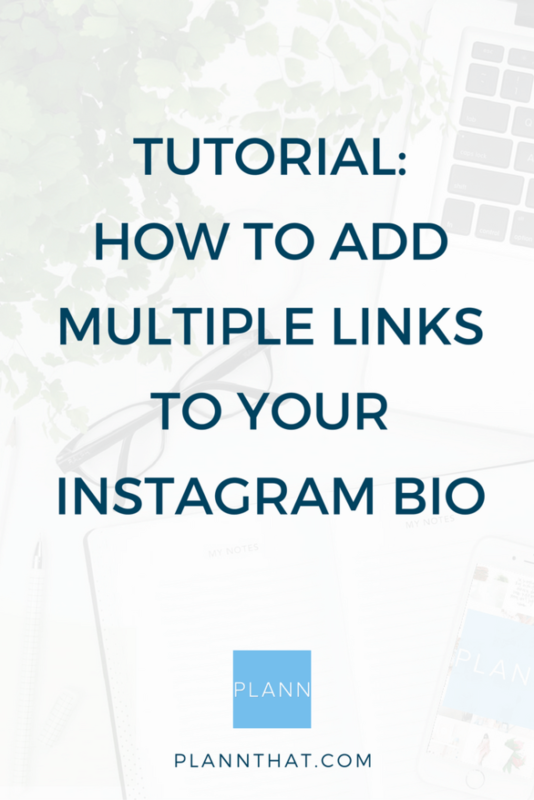 We’re all about getting you prepared for success faster and making your life as easy as possible – here’s our tutorial on how to add multiple links on Instagram in 5 minutes! What do I need to set up multiple links on Instagram? The best part is that it’s really easy and you’ve already got everything you need. I’m going to walk you through exactly how we set it up and the decisions we thought through in order to help you choose your links. Wait, why do I want multiple links on Instagram? It means if you’re sharing content (like a blog post) and you’ve also got a website you’d like people to visit, you can ask them to visit both! Or in same cases you might want to link to 4 or 5 things if you have a store, or even to promote your most popular blog posts. The best way to get people to click outside of Instagram has always been to ‘add value’, it’s a pretty big ask to stop people from scrolling for two seconds, and this doesn’t change, you’re still going to have to get people to click your link and add the same amazing amounts of value. Any by the way, have we mentioned yet that the links are also trackable so you can see which links are actually performing? YAS!! 4. From here, select the links you’d like to add, and as easy as it is to drag and drop your Plann images, you can organise your links. 5. Here’s what our dashboard looks like, and why we chose these links. We knew we were going to start letting people know about how to add multiple links on Instagram, and we wanted to display this piece of content first because it’s what you’ve come to find, plus our business mission is about making everything easier and help you be as successful as possible. Our App is revolutionary and we know more people need to hear about it and it’s also directly related to revenue and income, so it was either going to be #1 or #2. Without our customers using, enjoying and buying our products, we’re unable to continue to deliver a quality product and research new development. We recommend you have a think about what you think is the most important link for your business to be listed first. Is it content, a special offer or a helpful resource? As marketers, it’s best to always be testing and optimising so we’ll also be moving things around after a few days to see what works best. What else have you linked? Aside from our most recent blog post (this one! ), we want to stamp our feet and show we’re an authority in the Instagram space. We know it, but we need to make sure everyone else knows it. The way you create authority is by providing helpful value and thought leadership, and we show this with our regular blog posts and regular app updates. Obviously you don’t want to over-kill, but it’s good to think about the purpose behind each of the links if you’re thinking of adding more than 3 or 4. It’s easy to forget while you’re looking at all the pretty pictures, but Instagram is still a marketing channel. It means you have to keep an eye on what is working for you, and test and track how to optimise what works (and what doesn’t). The beauty of this tool is that you can come back anytime and edit, or drag’n drop to change things around when you’ve collected enough data. It’s really that easy, paste your link into your Instagram bio and your audience will be able to click through and choose their next interaction with you. Want to get even more organised? Our aim is to help more determined Instagrammers be successful and to catapult your beautiful brand. 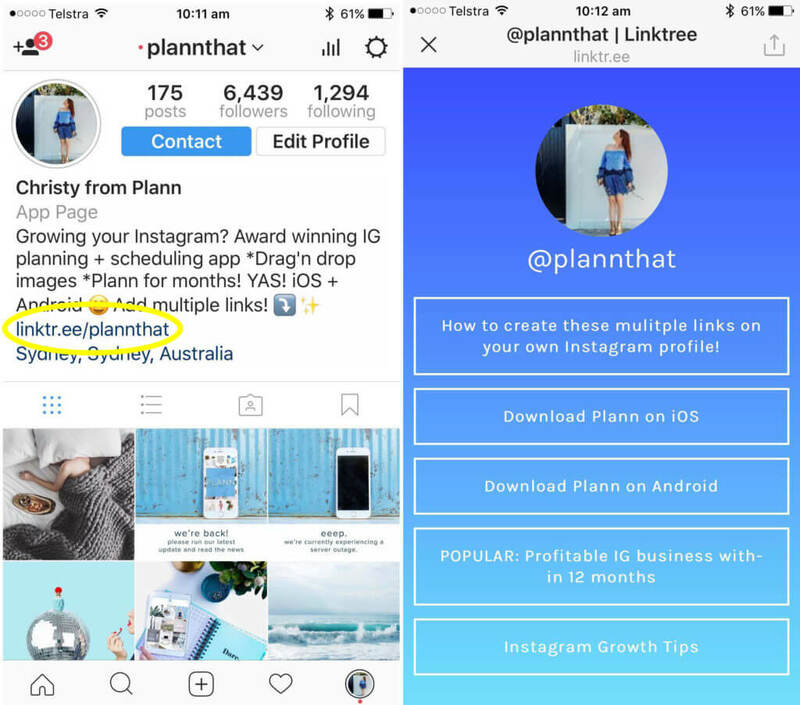 We designed our visual planning app Plann in order for you to make your mark on Instagram, where you can organise and design a follow-worthy feed right from your mobile. Haven’t tried using it yet? Download it for iOS and Android (even tablets!) to get started for free. Feel like you know a bunch of people are going to scream with joy after hearing about this? Share this post with friends or on your social media channels and we’ll be happy to share the confetti! PreviousPrevious post:How to find Instagram Hashtags to Attract Authentic FollowersNextNext post:How Lizzie Darden created a profitable Instagram business in less than 12 months.